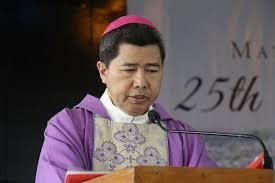 Bishop of Legazpi Joel Z. Baylon. Photo from Bishop’s Facebook file. Legazpi City, [05.13.18] – The Bishop of Legazpi has issued his pastoral statement this morning in a press briefing before the Albay media on the ouster of Maria Lourdes Sereno as the chief justice of the Supreme Court. The pastoral statement was entitled “Do not be afraid. Go on Speaking, and do not be Silent” Pastoral Statement on the ouster of Chief Justice Sereno and other Social Concerns. The ouster of Sereno s unconstitutional and the check and balance in government under democracy is under attack of the powers that be will rob the people’s freedom. Bishop Baylon explained that the moral foundation is the most important reason amid the ongoing political debates on legal technicalities on the ouster of Sereno from his post – culture of life, the virtue of truth telling and the system of accountability have been subjected to attacks by culture of death and fake news and abuse of power. These unfolding dark realities can hardly be denied by the Filipinos. As Christians we must witness to Christ’s charity by working on justice, peace and development as part and parcel of the evangelization that Christ in loving us is centered on the wholeness of a person, the statement said. 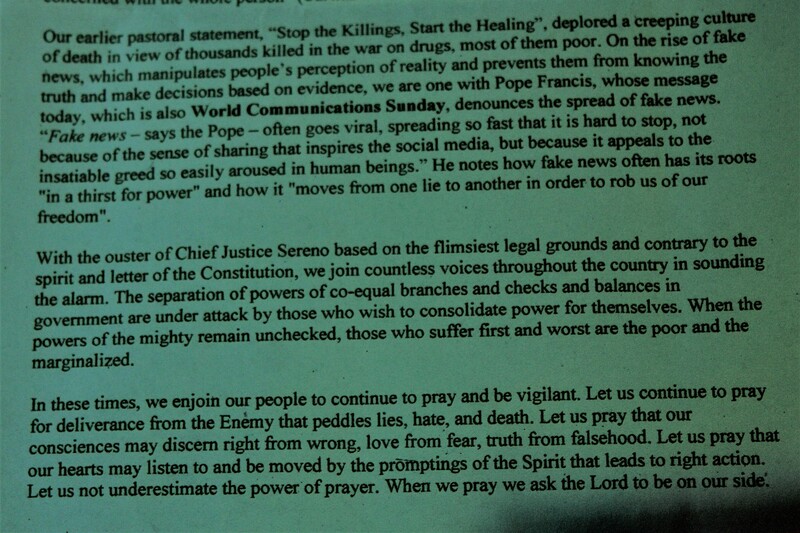 Similar to the earlier issued pastoral statement dubbed as “Stop the Killing, Start the Healing” condemning the brutal war against illegal drugs that inflicted on the poor – the rising prevalence of fake news that manipulates public perception on knowing the truth based on evidence, the recent pastoral statement runs parallel to Pope Francis’ message about World Communication Sunday, fight the spread fake news with vigilance. Meanwhile, Atty. Mejillano of the Integrated Bar of the Philippines – Albay was also present during the press briefing explained before the Albay media about the IBP motion for reconsideration. “The motion seeks to convince the Supreme Court Justices to reverse their vote, Mejillano explained. The Supreme Court en banc voted 8-6 on Friday to oust Sereno via quo warranto.